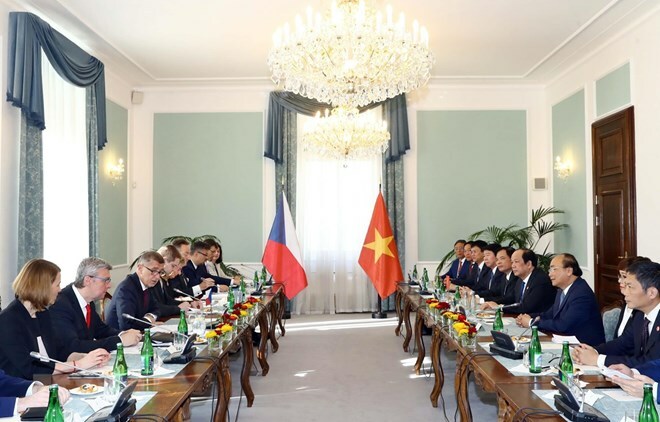 Prague (VNA) – Following the welcome ceremony in his honour in Prague on April 17, Prime Minister Nguyen Xuan Phuc later the same day held talks with his host Czech Prime Minister Andrej Babis. This came within the Vietnamese leader’s official visit to the Czech Republic from April 16-17. At the talks, the two PMs expressed their joy at the fine development of the relations of traditional friendship and multifaceted cooperation over the past nearly 70 years since the establishment of the bilateral diplomatic relations in 1950. The host affirmed importance of relations with Vietnam and described his guest’s ongoing visit as an important landmark in the bilateral relations. A close friend of Vietnam and an active member of the European Union (EU), the Czech Republic supports the intensification of the Vietnam-EU relations and will push for the early completion of EU procedures so that the EU-Vietnam Free Trade Agreement and the EU-Vietnam Investment Protection Agreement can be signed within one or two months to come, PM Andrej Babis stressed. For his part, PM Phuc stressed that the Vietnamese people always bear in their mind the valuable help and effective cooperation from the Czech Republic to Vietnam in their national defence, construction and development. The two PMs agreed to strengthen the exchange of delegations between sectors and localities of the two countries. They also concurred to closely coordinate their work to organise activities marking the 70th anniversary of the bilateral diplomatic ties. The two held that the economic cooperation, trade and investment between the countries are developing in a dynamic way but have yet to match their potential and expectation. They agreed to continue to effectively implement the mechanism of the Vietnam – Czech inter-governmental committee on economic cooperation and push up cooperation in the fields of security, national defence, technology, mining, and tourism. The host expressed his joy and belief that the early opening of the Hanoi – Prague direct air route will help further push up the bilateral relations in trade, investment and tourism, and spoke highly of the role and contributions by the Vietnamese community to the socio-economic development of the Czech Republic. Host and guest also exchanged ideas on international and regional issues of mutual concern, and pledged to further bilateral cooperation at international forums and organisations. The Czech Republic PM affirmed that his country supports Vietnam’s bid to become a non-permanent member of the United Nations Security Council for the 2020-2021 term. The two also stressed the importance of the maintenance of peace and stability, the promotion of security, navigation and aviation safety and freedom in the East Sea, and the settlement of disputes with peaceful means in line with the international law, especially the UN Charter and the 1982 UN Convention on the Law of the Sea. PM Phuc invited the Czech PM to visit Vietnam, and the invitation was accepted.